It's called Post Traumatic Stress Disorder (PTSD): the unending echo of battle etched in the brain which may affect up to 15% of soldiers by some estimates. It can destroy families, and can leave its sufferers unable to work, addiction addled and changed. Senator and Lieutenant General (Ret.) Roméo Dallaire of Rwanda fame also plays a major role in this film. For many years he has heroically spoken out in public to declare that he suffered intensely from PTSD and had attempted suicide. And today he continues to campaign on behalf of all soldiers who suffer. 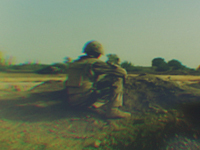 War in the Mind also investigates the issue of soldier suicide. Statistics from past and present wars tell the sad story of the magnitude of this problem. Currently more soldiers are dying from suicide than in battle. Families who have felt invisible, their sons' stories unacknowledged, tell of the impact of their loss. Yet this film also discovers that with effective treatment suicide can be prevented. Our cameras gained unique access to a UBC/Royal Canadian Legion program which helps soldiers undo the wiring that military training has implanted in their brains, confront their pain, and learn to live again. Note: This film necessarily includes disturbing scenes of war as well as some profanity. Grade Level: 10-12, College, Adult. "A compassionate, respectful and honest portrayal of the effects of PTSD in the strongest of the strong: our fighting forces. I salute the makers of this documentary, and the heroic soldiers in this film, braving, again, their own fears to tell their stories, so that others may live. I recommend this film to educators who want to provide an accurate portrayal of this disease to students of mental health, as well as to policy makers, leaders and decision makers involved in bringing forward the ravages of this honorable injury." "The Canadians have shown the way in innovation when focusing on post-war adjustment and adaptation; of moving on somehow; getting along back home...This extraordinary video combines powerful videography with interviews of extraordinarily candid and brave Canadian war veterans. War In the Mind should be watched by every military veteran, family member, and those who work with or care about veterans of modern military war." "War in the Mind is a chillingly accurate representation of the psychological wounds suffered by some military personnel. Filled with stirring real-life narratives of those who have served in war, this is an invaluable tool for informing educators and healthcare professionals about PTSD. It is also a thoughtful means for helping Wounded Warriors realize that they are not alone." "Provides a comprehensive overview of the real-life challenges faced by military service members and their families. It allows the public to see the complexity of living with and recovering from posttraumatic stress disorder (PTSD). Uniquely, War in the Mind allows the viewer to see the impact of PTSD through the eyes of the veteran and his or her loved ones. It is both heartwarming and gut wrenching at the same time_[This] film would be of benefit to clinicians who may not be familiar with the various presentations and effects of combat PTSD. It would be also of likely value to psychology interns, residents, and postdoctoral fellows, particularly those who plan to work in military settings." "The good news is that suicide can be prevented with intervention and effective treatment...War in the Mind is worthy of the highest recommendation, especially for public library collections." DVD includes a post-screening discussion at the University of British Columbia with some of the soldiers featured in the film, SDH captions for the deaf and hard-of-hearing, and scene selection. Moving portrait of legendary environmentalist and Vietnam vet, Doug Peacock.